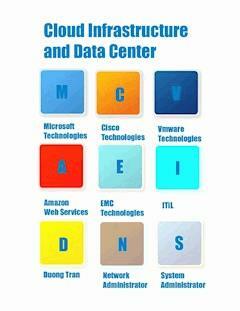 Cloud Infrastructure and Data Center Book is a collection of Information Technology big pictures. The purpose of the book is to help students and network system administrators to learn Information Technology. The book covers many topics such as networking, system administration, cabling, VOIP, desktop management, server management, information storage, IT security, wireless, mobile management, cloud infrastructure, software-defined-data-center, software-defined-storage, software-defined-network, data center, automation, orchestration, problem solving, disaster and recovery, risk management, asset management, time management, budget management, project management, IT services, and the future of IT. The rated is entry level to manager level. The actual values of this book are $10,000 of training and four years degree. All rights reserved. No part of this book may be reproduced, copied, stored or transmitted in any form without prior written permission from the publisher. Cloud Infrastructure and Data Center covers all-in-one Information Technology 2016 and Network System Administration 2016. This book is a collection of Information Technology big pictures. The purpose of the book is to help students and network system administrators to learn Information Technology. The book covers many topics such as networking, system administration, cabling, VOIP, desktop management, server management, information storage, IT security, wireless, mobile management, cloud infrastructure, software-defined-data center, software-defined-storage, software-defined-network, data center, orchestration, automation, problem solving, disaster and recovery, risk management, asset management, time management, budget management, project management, IT services, and the future of IT. This book is for everyone students and managers. This book is worth more than $10,000 of training and four years degree. I recommend the network system administrators to keep the book as a hand book and read over and over again for weeks, months, or years. The facts are valid for years. Thanking you for supporting my book. Computer and Information Systems Managers require organizational skills, leadership skills, communication skills and project management skills. Network and System Administrator require problem-solving skills, multitasking skills, and normally 24/7 support.